The Ice Bucket Challenge: Did It Work? Remember the Ice Bucket Challenge, the social media videos that went viral during the summer of 2104? What began as a few videos circulated between some charity volunteers snowballed into an internet sensation. Its premise was simple: Make a video challenging friends, family and co-workers to donate money to fund ALS, a rare neurological disease, and then dump a big pail of ice-cold water over your head. Millions participated and countless others watched and shared the videos online. It didn’t hurt that some heavy-hitters, like President Obama, Bill Gates, Oprah and Justin Timberlake jumped on the bandwagon. At the time, the challenge had its naysayers. Vocal detractors dismissed it as nothing more than a manufactured publicity stunt. Others called participants “slactivists,” a derogatory term for those who use the internet to project an activist persona but in actuality do little to help a cause. While it’s true that some individuals participated in The Ice Bucket Challenge but never donated money, plenty of others did. So many, in fact, that the critics were proved wrong. Eight weeks after it began, 17 million people had uploaded a video of their Ice Bucket Challenge, raising a massive amount of charitable donations and creating higher name recognition for ALS and the 20,000 Americans living with the disease. Even more astounding was the financial windfall – $115 million donated to the national ALS Association and an additional $13 to local chapters across the country – a sum more than twelve times as much as the nonprofit raised the year before. Improbable as it initially seemed, the grass-roots challenge became a grand slam in the world of charity fundraising. And, the good news keeps coming. Recently, researchers announced in Nature Genetics that a million dollar grant, which came directly from the Ice Bucket Challenge, had spurred the identification of NEK1, a new gene associated with ALS. “Global collaboration among scientists, which was really made possible by ALS Ice Bucket Challenge donations, led to this important discovery,” said John Landers, Ph.D., of University of Massachusetts Medical School and one of the MinE project’s leading researchers. ALS was first identified in 1879 by a French physician, but it is still a mystery to the scientific community. ALS stands for amyotrophic lateral sclerosis. The disease is also widely known as Lou Gehrig’s disease, after the famed New York Yankees baseball player who died from the disease in 1941, at age 38. A progressive degenerative neurological disorder, ALS attacks the nerve cells in the brain and the spinal cord. It assaults the motor neurons controlling the body’s muscle function, slowly destroying them. Over time, ALS victims lose the ability to speak, move, swallow and eventually even breathe on their own, all while the brain remains sharp and alert. The disease can strike sporadically, or it can be inherited. At any one time, some 30,000 Americans are living with the disease. Although it is not fully understood why, veterans are twice as likely to be diagnosed with ALS. The debilitating illness has long perplexed the medical community. When the grass-roots Ice Bucket Challenge came along, it provided a tremendous influx of funding allowing scientists to collaborate, test new theories, and conduct trials. As the challenge wound down in the early fall of 2014, the ALS Association was poised to keep the momentum going. The organization moved quickly to identify five targeted areas of research: gene discovery, disease model development, biomarker identification, clinical trials and drug development. Next, it earmarked two-thirds of the donations for ALS research that showed promise but lacked the financial resources to get started. 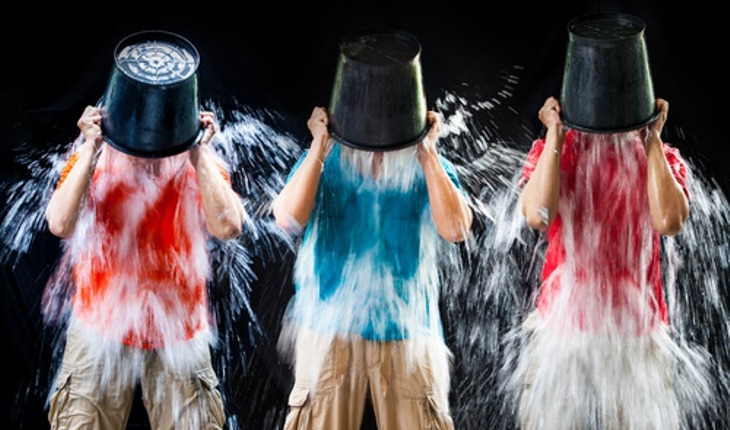 Twenty percent of the Ice Bucket Challenge contributions were then allocated to patient and community services, thereby allowing some chapters to hire additional staff or launch “wish list” programs. The remaining money, 11 percent, has helped expand education and begin new fundraising efforts. In addition to raising money for research, the Ice Bucket Challenge brought about more public awareness and a better understanding of ALS. Before the Ice Bucket Challenge, the ALS Association estimated only half of the general public knew much, if anything, about the always-fatal disease. Google searches exploded during and after the challenge, and an estimated 440 million people have viewed the challenge videos. Name recognition isn’t a big problem anymore. The ALS Association has made the Ice Bucket Challenge an annual event. Learn more here.